Traps are generally used to provide an indication of pest presence in a cropping region or field – not to provide an estimate of pest density on which management decisions can be made. There are some exceptions to this, where traps are the primary means of estimating pest abundance in a field e.g. shelter traps for slugs. The most common application of traps (e.g. pheromone traps for immigrant Helicoverpa punctigera, fermentation trap for armyworm) is to guide crop managers in terms of when to start closely monitoring the crop for a particular pest that has been detected in a trap. Crop sampling techniques for decision making are discussed in the section on monitoring techniques. Pheromone traps use species-specific chemicals to attract insect pests. The pheromones are chemical signals emitted by the female of the species to attract a mate, therefore pheromone traps only catch males. They are best deployed to signal the arrival of influxes in moths into a region. 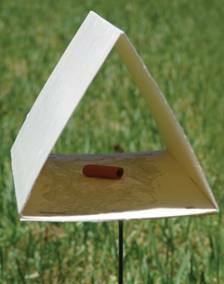 Pheromone traps have an advantage over light traps in that they only collect the species of interest. Light traps on the other hand attract a large number of species and sorting through collections can be extremely time consuming and requires a high ability in identifying insects. 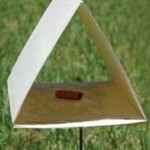 Pheromone traps are unreliable indicators of pest abundance. Side by side pheromone trapping and paddock monitoring for Helicoverpa punctigera has shown no correlation between moth catches in pheromone traps and egg or larval counts in the crops. The effectiveness of pheromone traps depends on correct placement. In order to detect changes in pest abundance locally, the traps need to be placed in the field before the pest becomes active or immigration events occur. Be alert to recommendations for placement in the field i.e. height, proximity to the crop, influence of full moon/rain/temperature. In more intensive agricultural systems, there are examples of pheromones being used in managing pests through mass trapping and mating disruption – for more information see the section on pheromones. Light traps are used to monitor the activity of a range of insect species. Light traps are the only option for monitoring the activity of species for which there are no known (or commercially available) pheromones. Light traps are easy to construct and deploy, and suitable for very recognisable species that are not easily damaged in the trap (e.g. beetles). The major downside to light traps is that they are not selective and numerous species of moths, beetles, flies, and other insects, most of which are not pests, are attracted to the light. Sorting collections is extremely time consuming and requires a high degree of competency in insect identification. Individual insects (particularly moths) are often damaged by beetles in the traps, making identification even more difficult. Deploying light traps for a short period of time (e.g. a few hours around dusk), killing the insects as they are collected with insecticide or directly into alcohol will make the task of sorting considerably easier. Pitfall traps consist of containers dug into the soil with open tops flush with the ground surface. They are used to capture invertebrates that crawl over the soil surface and fall into the opening. A variety of containers (e.g. 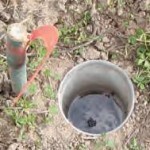 plastic cups) can be used for pitfall traps. The containers usually have fluid (detergent/water mix or glycol) in the bottom. 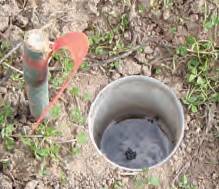 The trap must be placed flush with the soil surface, to avoid insects walking around the trap. Detecting the activity of predatory ground beetles (carabids). Shelter/refuge traps are useful for monitoring species that are active at night. The traps provide a cool, moist, dark refuge for these species and can serve to concentrate individuals for easy detection (easier than digging through the soil). In some instances shelter traps are the only way to get an estimate of pest numbers (e.g. slugs). Deploying shelter traps for estimating pest abundance requires the same level of replication as you would apply to sweep net or beat sheet sampling i.e. multiple traps across the field. Baits can be placed under refuges or shelters where crawling insects may hide. Count the number of pests after a few days. Be aware that baits which actively attract slugs and snails can result in numbers which are artificially high. It is important to sample representative parts of each paddock because the distribution of pests can be patchy. Monitoring for slugs before, or at, establishment. Germinating seed baits are designed to attract soil insect pests to enable decisions to be made about the need for seed treatment, or at-sowing treatment to protect an establishing crop. The monitoring soil insect page has a detailed description of how to use germinating seed baits, and other methods for monitoring soils insects. Monitoring for false wireworm prior to sowing canola, sorghum, sunflower. Monitoring for black field cricket, earwigs prior to sowing. Common armyworm can cause significant damage to winter cereals, particularly ripening barley, in spring. Armyworm moths are active in early spring (September – October) and detection of large numbers of moths is indicative of a potential outbreak in crops as they ripen. Because armyworm larvae are difficult to detect in the field, and major yield loss can occur in a matter of days (head lopping), early detection of an outbreak is of considerable benefit. Whilst armyworm moths are attracted to light, the fermentation trap has the advantage of attracting only common armyworm moths, and avoids the need to sort through light trap collections. The fermentation trap comprises a mesh-covered cone into which the moths are attracted with a lure mix (10% port, 15% brown sugar and water) suspended beneath the catch bag. The lure requires topping up every 1 or 2 weeks according to the season. Trapped moths are simply removed, dry, from the catch bag for counting. 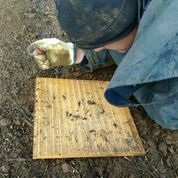 Sticky traps can either be simple intercept traps (catching insects that fly into them) or made attractive to insects through the use of colour (usually yellow or white). One or more surfaces of the trap is covered with a non-drying sticky substance. When the insects encounter the trap they become stuck and can then be counted. Traps have a useful life of one or more weeks, depending on the field conditions (dust shortens the useful life considerably). No known examples of where sticky traps are used routinely for monitoring pest activity. Mirids and aphids can be monitored using sticky traps, but regular crop monitoring is likely to be a more accurate indicator of pest activity in crop.